Thanks for reading our course blog! Our field school has come to an end, all too quickly. Some of the students have already departed for the airport, and the rest of us will go our separate ways by this evening. Along with all the challenges and the questions, it has been a tremendously rich learning experience for everyone. I think everyone will return to Canada a changed person, and with a much broader view of intercultural exchange and volunteerism. Many thanks to our fantastic partners at Himalayan Explorers for making it all possible: this couldn’t have happened without the hard work of Raja, Vaila, Vinay, Sachin, Kapil, Ishan, and Raju. Thanks also to our drivers for getting us safely to and from our many destinations, and to the guest speakers who gave us their time and thoughts about life in exile, Buddhism, women’s rights in India, ayurvedic medicine, human rights in Tibet, and the Indian educational system. Thanks for reading our blog! Now the best thing that you can do is to support our students on their return by giving the time to listen about these experiences and asking good questions. Although the India Field School has now come to an end, the learning has only just begun! Today was a day a day I will not likely forget. Being able to meet and shake the hand of His Holiness is an experience that few people get to have. After breakfast the group assembled nervously on the lawn of the guesthouse and we were given a quick lesson on etiquette. At this meeting I volunteered to carry the statue of Green Tara, the female Buddha of enlightened activity, to be blessed. The group then made our way down to the Dalai Lama’s temple; we arrived during the morning session of the weeklong puja and joined the throngs of people, Tibetans, Indians and westerners hoping to catch a glimpse of His Holiness. As people hurriedly lined the road between the temple and the residence I could not shake the feeling that we actually had a scheduled appointment and would be able not only to see His Holiness, but we would be able to engage and interact with him. Standing near the entrance with Khata scarves in hand, it soon become obvious to those surrounding us that we would likely have the privilege of having an audience with His Holiness. As a group we have discussed the notion of privilege at length. But at this moment I truly felt it. In a temple surrounded by devout monks and nuns, it was us, the group of Canadian students would have the opportunity to spend time with him. After leaving Green Tara to be blessed and making the final adjustments with our Khatas we were escorted inside the main gate and joined a queue of roughly 200 others. After waiting roughly 20 minutes, it was our turn. Dr. Paras asked how to teach politics with compassion, after a few jokes about politicians and politics in general, His Holiness talked for about three minutes, most of which I missed, likely due to how awestruck I was by his presence. After some group photos, greetings and tears it was over. Our group gathered to collect ourselves outside the main gate, each one of us a whirlwind of emotion, all struggling to process the gravity of the situation. I collected the Green Tara and made my way back to Temple courtyard. It was not long before I realized something extraordinary was occurring, with my Khata scarf still draped around my neck, I carefully carried the Green Tara through the courtyard; while walking I noticed many monks and nuns smiling widely at me and even bowing their heads and holding their hands in prayer. I was holding the statue of a recently blessed Green Tara in my hands. It’s a surreal feeling to have people bow and pray when you walk by. 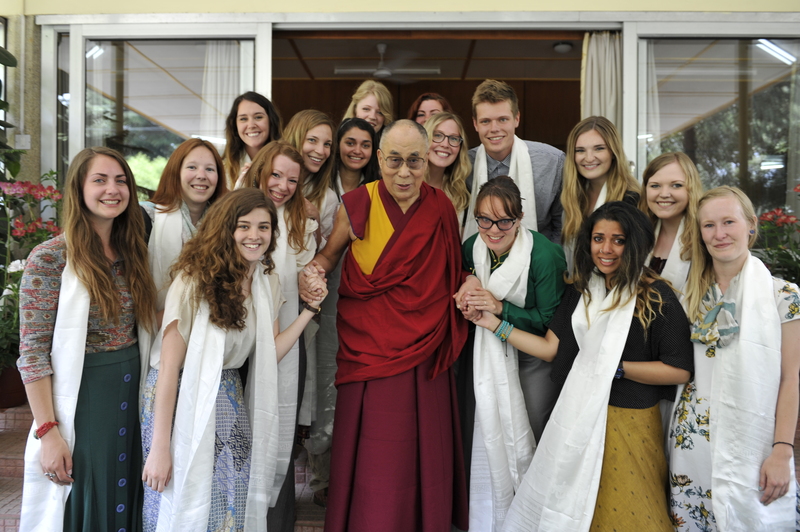 I knew before how privileged we were as a group to have had the opportunity to meet His Holiness, but it was further cemented in the moments after. It’s something that I have struggled with individually and I know some other classmates have felt the same way. Many Tibetans don’t get the chance to meet his holiness ever, we were in Dharamsala for one month and we were given the chance. Writing this blog I am still awestruck by my experience, it is something I won’t soon forget. In our preparatory class last semester, much of the literature we read focused on the conditions under which ‘voluntourism’ can be effective. There seemed to be a consensus in the research we reviewed that opportunities for developing ‘thick’ global citizenship, participating in equal cultural exchange, and doing meaningful work increase with the length of the trip. There also appeared to be significant evidence to support the theory that opportunities for doing harm can be reduced by extending the length of the experiential learning trip. The length of the India Field School program is something I considered when deciding whether or not to take part in this trip. When thinking about this trip in abstraction, from my regular life back in Canada, one month in India seemed like a long time. I felt that compared to some of the very popular voluntourism trips that seek to entice participants by combining a week of work with many more weeks of tourism and adventure, this seemed like enough time to dive into a project and truly get involved in an organization. This month has absolutely sped by. While I feel extremely comfortable and settled here in Dharamshala, I also feel as though I have been here for barely any time at all. At the Tibetan Centre for Human Rights and Democracy (TCHRD), where I am placed, there is a very established internship program. Most of the interns work for periods of 2-6 months. When it comes down to it, though I am here for one month, I only spent just over two weeks actually working at my placement. The discrepancy between the time I spent at TCHRD and the time spent by other international interns led me to confront the notion of time constraints. What is their implication for doing good work? What is their implication for international voluntourism programs, and do my two short weeks at TCHRD truly differ from the status quo of these trips? Despite the very real challenges presented by time constraints, I believe that my time here is different. After some careful reflection, I have come to realize that this is due to the fact that my placement was planned around a specific project. I was tasked with creating an educational booklet for human rights defenders in Tibet to inform them of their rights under international law, as well as options for recourse should their rights be violated. The project-based nature of my placement allowed me to use every minute of those two and a half weeks efficiently. I also never felt that my presence was a burden, as I had clear instructions and timelines from the outset and did not need much direction apart from this. This has led me to reflect on whether project based voluntourism programs might mitigate the negative effects of time constraints to which these trips often fall victim. Additionally, I have been thinking about how creating longer term connections can help volunteers overcome the barrier that time constraints pose to meaningful work. I plan to stay in touch with all the remarkable individuals I met at TCHRD. If possible, I plan to do some work remotely when I return home, and to continue disseminating the information they spread though my networks in Canada. This Thursday afternoon Kendal and I are planning on leading a local waste pick up with the students at the Gamru Village School! I have been so excited about this as this is one of the activities we initially hoped to do with the students! We’ve planned to arrive mid-morning Thursday with gloves and bags, review final details with the principal Meenakshi, and then begin the pick-up. Today I asked Raja, who is from the Gamru Village area, where we can purchase gloves and bags, and where we can place the waste bags once the pick-up is completed. He then brought to my attention a number of logistics: We’ll need a first aid kit and a car parked nearby in case of emergencies. We’ll also need to send any students directly to the hospital if they get a cut. He asked me where exactly the pick-up would be taking place, and if I had considered feces in the waste and dangerous objects such as glass and needles. These are all things I did not think of. When Meenakshi confirmed the waste pick-up date with us last week, we asked if we could purchase the bags and gloves, and that was that. Why didn’t I think of asking more questions? Did I assume that because the Gamru School has done waste pick-ups before that I didn’t have to? Is it okay to assume that the pick-up will be directly in the vicinity of the Gamru Village School? Why have I not thought about potentially dangerous objects? What will we do if a student encounters feces or gets a cut? A perception of waste I have heard and have perceived in Dharamsala is: “As long as I don’t see it”. However, along with the potential perception of “as long as I don’t see it”, is a lack of waste facilities. Where are we actually going to dispose of this waste? I believe that my lack of inquiry into this event is partly due to my familiarity with the waste management system at home in Canada. Blue, clear and green bins are placed all around the City. Most homes are equipped with adequate plumbing, waste bins and information on how to sort our waste into these bins. The municipal waste processing facilities are just on the outskirts of town and is open to the public. I have not truly thought about waste awareness and a cleaner environment as a privilege, but at home, free of charge, I am equipped with all of the resources and information to be able to properly dispose of my waste, and know where it goes. This is not the case for the Gamru community and this waste pick-up. The objective of a waste pick-up for these students, from my perspective, is to be aware of their environmental surroundings and how minimizing waste is a positive contribution to their environment. Within the curriculum the students are taught to keep their environments clean. However, if there are no legitimate waste facilities nearby nor accessible information about waste, and the waste is simply being displaced, is this really creating a positive environmental awareness for the students? Over the last three weeks, I have had many experiences that have contributed to my learning as a visitor to the complex, transient hub of McLeod Ganj, as a researcher of the effectiveness and issues of international volunteerism, and as an Ally to the Tibetan cause. Beyond new friendships I am making and novel experiences I’ve come to cherish, I have really started to think about ways that I can participate in ‘development’ when I return to Canada and into the future. Something our Field School program has tried to instil is the hard notion that short-term international volunteering, often taking place in the Global South by well-intended Northern participants, can act – but not necessarily, as a brief and partial catalyst to encouraging empathy, solidarity, and change in the quality of life’s conditions of others. In such a short time, I have tried to adapt to new surroundings and cultural norms, have bonded with some locals, and have learned a lot about this particular culture, issue, and place. But moreover, it has become so apparent that inequalities and injustices plaguing certain communities in the world over others are directly and indirectly the result of interconnected global systems at play. In fact, it is critical that we acknowledge that some study abroad/international volunteering experiences may perpetuate conditions of poverty and privilege between host communities and visiting guests. It has thus become much more obvious, now already being here, that I may have a much larger role at home in Canada to encourage widespread solidarity with marginalized and oppressed groups, like Tibetans under China, and others alike, than from solely being here for one month’s time. 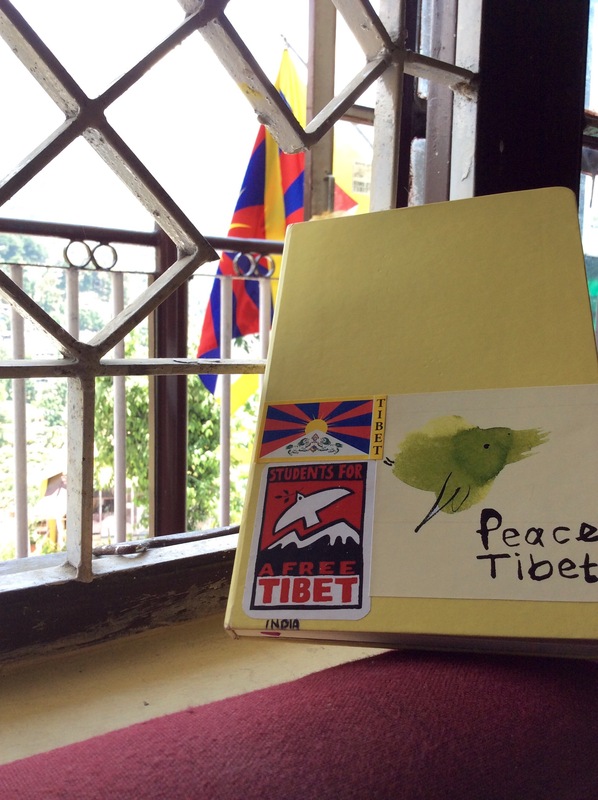 A few conversations I have had at Students for a Free Tibet have taught me some insightful lessons that apply to solidarity and international community engagement experiences. Two Tibetan peers shared with me some cultural ‘sayings’, both relaying how important it is for people on Earth to recognize how dependent we are on one another, and how acts of compassion make the world a better place for everyone. I have inherited a very fortunately life in Ontario, which often shelters me from facing hard facts, every day, about historical and ongoing global economic, political, and social/psychological systems that cushion my upbringing and provide me opportunities, and have actively left others disadvantaged or essentially forgotten. Perhaps it is precisely because Im recognizing these privileges, being so young, with such an education, socio-economic status, amongst other integral factors, that I am capable of taking on the challenge of facing my government, media, and peers back home taking a stance advocating on behalf of individuals and communities around me that are burdened, silenced, or oppressed in ways that I do not necessarily experience every day. Individuals – especially those burdened less by discrimination, truly do hold a lot of power to have their words, values, and concerns listened to, and perhaps once acknowleding their privileges and participation in systems of inequality, can move past feelings of ‘guilt’ in order to take on the responsibility/obligations to others in the world, even in their backyard, as an Ally willing to acknowledge privilege and power imbalances, and to commit to actions to change them. As I lie in bed sick today, I have been reflecting on what it would mean for a woman at the Dolls4Tibet workshop to take a “sick day”. The other day, a Tibetan woman from the workshop was telling me how for the past couple of months she has been trying to figure out what is wrong with her and find medication that will help alleviate some of the pain. She ended up having to take a month off of work to travel to New Delhi to seek medical assistance, however when she returned to Dharamsala the pain and other symptoms continued. She went back to a hospital in Dharamsala, but because her Hindi or English isn’t very good she wasn’t able to communicate her problems to the doctor very well. Thankfully, Mona, the owner of Dolls4Tibet has arranged for a translator to go with her so that there would be less miscommunication this time. This makes me wonder how many other Tibetans living in Dharamsala have had the same problem of miscommunication while trying to seek help for medical conditions. Are they aware that there are services available for them, such as translators, or other means of assistance? This experience has shown me that one of the major problems in the health care system is getting the word out there on the types of services that are available. I think this is also a major problem in Canada as well. We can create all of these programs, and services but if no one is aware of them, then what is the point? I think this notion can also be applied to development programs in general, if there is no involvement of the community or no awareness then the program would be stuck at a standstill. As we had learned in our preparations, negative impacts of development programs can occur when the local community does not manage the volunteer program, or if the there is no cooperation between the local community and the foreign volunteer program. This can lead to tense relationships between the two actors, and can disrupt the power balance. Furthermore, when there is no collaboration between the two actors it can also disempower the community members and lead to actions that resemble colonialism behaviours. In addition, when women at the workshop miss work due to an illness, it doesn’t often mean that they are at home lying in bed all day. Most women will try to do as much piecework as they can at home so that there are not missing an entire day’s of work. Like in many small businesses there is no one to “cover” their shift, so often when a woman takes a large amount of time off work it not only impacts the livelihood of the woman, but it also takes its toll on the business as a whole. This makes me wonder if there is government support in situations like these where an employee is required to take a long leave of absence due to an illness? This is a question that definitely requires more investigation. Health care and the role of the government are key aspects that almost every state struggles with. When thinking about how complex and diverse the cultures are in Dharamsala alone, I can’t imagine trying to implement government programs or health care services that are readily accessible to everyone in this environment. This past weekend our group went for a three day trek. The first day we hiked out to our campsite, where we stayed for the two nights. The weekend was comprised of classic camping activities, such as ghost stories and card games. 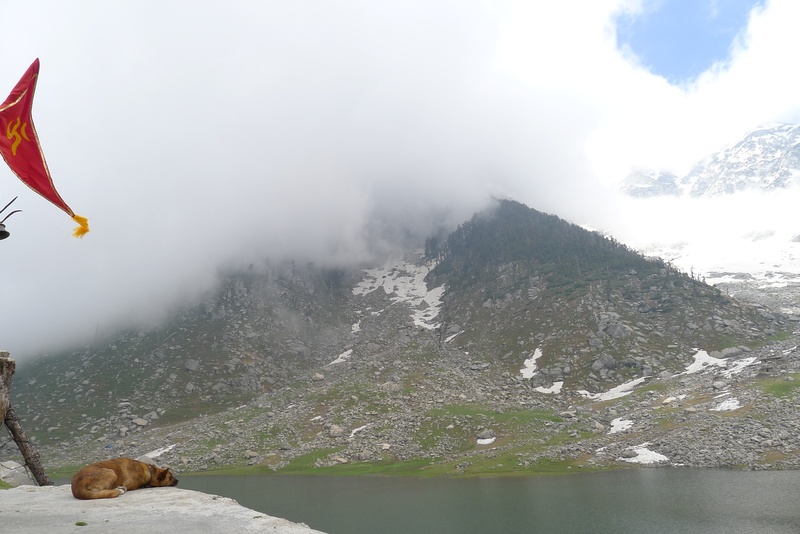 On the second day there was an optional trek comprised of 13 km uphill to Kareri Lake, and 13 km back down again. As I am someone who gets extremely winded on the way up to our guest house it may surprise you that I decided to do this optional 26 km trek. Though I stand by my excuse that the air thinner here, and the reason that I weeze so heavily up that hill has nothing to do with my general lack of physical fitness. The surface of Kareri Lake is about 3000 m above sea level. I also learned that it is one of eleven sacred lakes. There was also a shrine dedicated to Lord Shiva on the hilltop we ate lunch on that overlooks the lake. Kapil and Ishan led us up the mountain, they were both so incredibly impressive that I’m still not convinced that they are not super humans. I’m constantly surprised in the best way by what people can accomplish. On the way up Kapil told me that this was his favourite trek. The fact that Kapil was willing to share his favourite trek with us made me feel so privileged. It is incredibly special when someone is willing to take you somewhere important to them, that gesture alone makes it special for you too. Your experiences shape who you are. But I think that people often forget how heavily who you are can shape your experiences. Being able to stand and look across the sacred lake made me feel incredibly privileged. I was afforded an opportunity many being don’t get to experience, even within the surrounding area, because of who I am, and who I was with. However, by going on the hike I wasn’t able to go with the rest of the group to Kareri Village. Without seeing the village, my experience trekking up the mountain are devoid of the social context and importance that it exists within. We did see other people along the way, but my focus was intently on putting one foot in front of the other. Retrospectively, it would have been amazing to talk to people in the village or on the trek. As it stands, the experience feels a bit odd, like when you walk through a neighbours’ backyard without their permission. You feel like you are invading on something special and personal to them. All in all, the entire weekend was an amazing experience. Charlie (pictured below) really felt that hike harder than anyone else. With all the running back and forth she probably trekked twice as far as the rest of us. There is likely a lesson in there about knowing your own limits, and knowing just how hard to push them. The folly of youth.